Caren Harp, administrator, Office of Juvenile Justice and Delinquency Prevention, briefs members of the Justice and Public Safety Committee at their meeting Saturday. Photo by Denny Henry. Andre Bethea, policy advisor for Corrections and Reentry, Justice Department, has a message for counties: “I can’t make awards if you don’t apply — creativity is on you,” he told members of NACo’s Justice and Public Safety Policy Steering Committee Saturday morning at the kick-off to the association’s annual Legislative Conference. Bethea, a former 911 operator in New York early in his career, amazed members with his ability to recall grant activity in each state and discussed with members which states and counties were actively seeking and getting grants, and which were not. Members heard from federal partners and policy experts on the latest developments in justice-related policy issues. 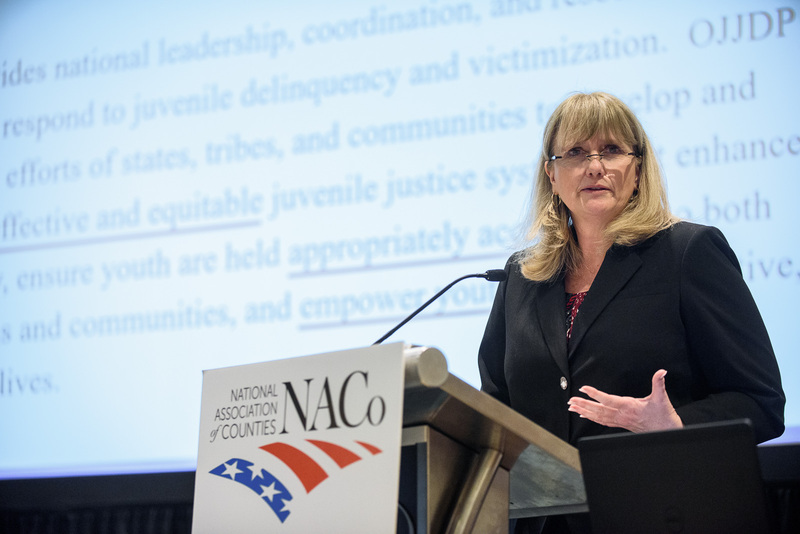 Discussion topics included the outlook for implementation of the Juvenile Justice Delinquency Prevention Act and the Second Chance Act, passed in the closing days of the 115th Congress. “I’m for pushing funding outside of the beltway,” Caren Harp, administrator, Office of Juvenile Justice Delinquency Prevention, Justice Department, told the audience. Several members of the committee had questions for Harp about prevention funding for girls and women since they’re seeing an uptick in crime in that demographic. Harp told them there’s $2 million a year to spend nationwide, and some said they thought that amount was too low. Harp said to be sure to let their representatives in Congress know if they need more funding in that area.